I´m a collector & seller of football boots since 2006! The Boot Vault is all about footballboots and my personal footballboot collection. All pictures are taken by me, if not different stated. 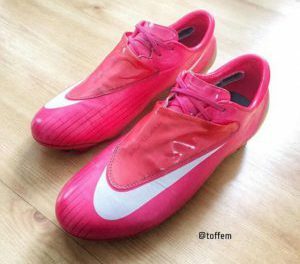 are the nike mercurial euro 2008 FG SL’s for sale? if yes, how much are they? I have a collection of adidas predators too, is it just a hobby for you? would you be interested in buying me some through paypal? Hey there! Do you have some Predators Uk 11 to sell? Hi they are the . Adidas Predator Precision 2000 Sg “Platinum” only 333 pair made, they are brand new and unworn, size uk 7.5 changeable metal blades with the original tool to change them and also they come with the matching bag and a certificate of authenticity which is also still sealed, would you be interested? Maybe 🙂 you got pics? You currently selling any size 9.5 UK boots? I want the nike green speed, I do not know where to find them and if I find them too expensive, my foot size 27 cm that is 44 eu, you have it? if they how much they cost? Sorry, eBay is the best option. Hi there, I have some interesting boots that I want to sell. Where besides Ebay can I sell this kind of boots? And/are you interested? – Nike Match Mercurial (2000) in black (UK 6). Love your boot collection by the way!!! Wondering are the Adidas Predator Aveiro Sg for sale. If so what size are they? Do you have any adidas boots size 9.5uk or 10uk for sale?? Hi, I saw your older post about boxed limited edition Predator Precision sg. I have a pair also, size 8.5 UK. Limited edition number 012/333 J and am looking to sell and would like to know if you have any interest. I’ve plenty of pictures which I can send if you are interested? Hi there! Thank you for reaching out 🙂 Yeah please send some pictures?